Join us at the dinner table! Did you know we have a Supper Club that is exclusive to our current program participants? We work with local Muskoka restaurants to create 3-course meals that are plant-based, low oil and often gluten free. Call (705) 637-0239 or email rachel@williamscardiology.com for details or to purchase your ticket. Did you know we offer LUNCH & LEARN Intro and Advanced Programs? In one hour a week you will be supplied with the information you need to improve your heart-health through plant-based eating. 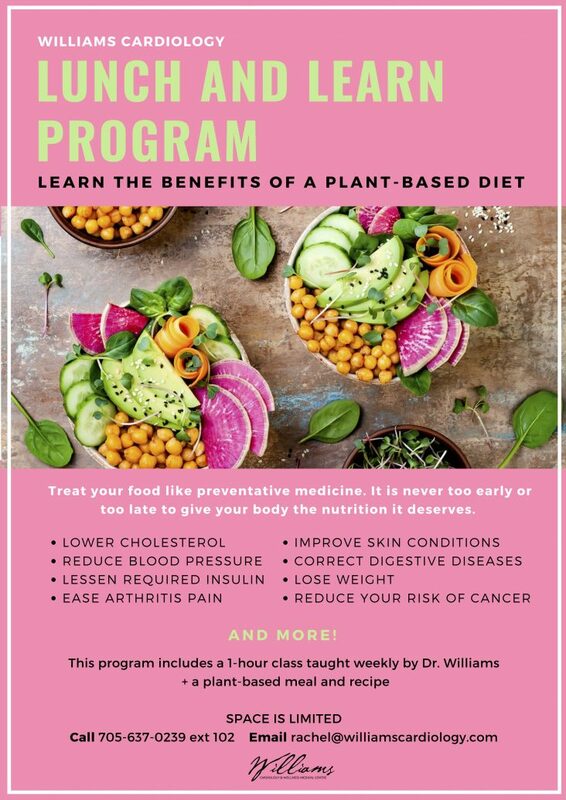 During the weekly hour-long session at Williams Cardiology in Bracebridge, Dr. Shane Williams gives a concise presentation on the science behind heart-healthy plant-based eating, current health topics and a question and answer period. The classes are not lectures – but lively discussions & presentations – and there are no demands put onto the participants other than to come with an open mind. Dr. Williams will guide you towards improving your health by eating plant-based. In doing so, many of our participants have reported weight loss and reductions in medication, joint inflammation and insulin required for diabetes. 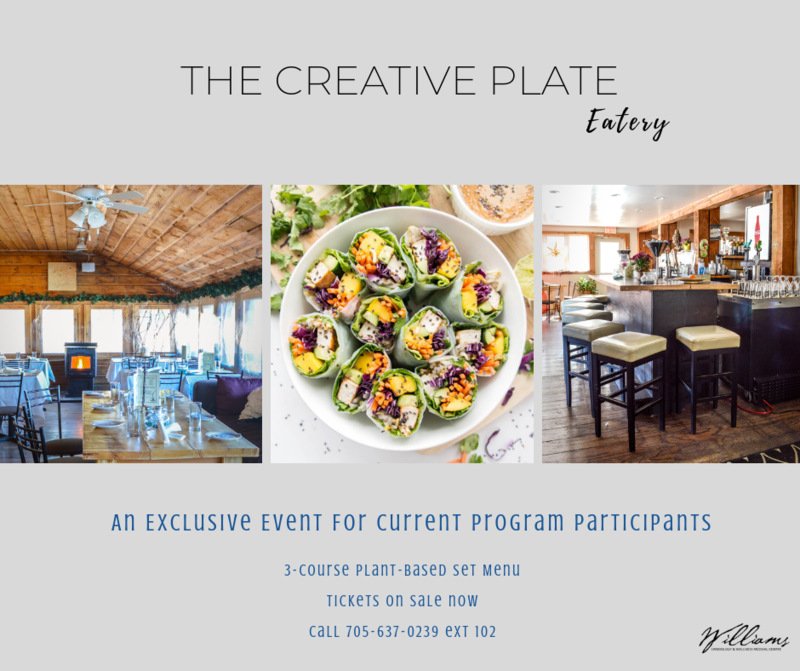 To help you explore healthier eating, a complimentary plant-based meal prepared by local restaurants & chefs is provided at each class along with the recipe. The program also includes bonus Cooking Sessions that take place at the Independent Grocer in Bracebridge where a local chef or guest chef from the Greater Toronto Area will prepare 4-5 recipes in front of you and then you sample each one! 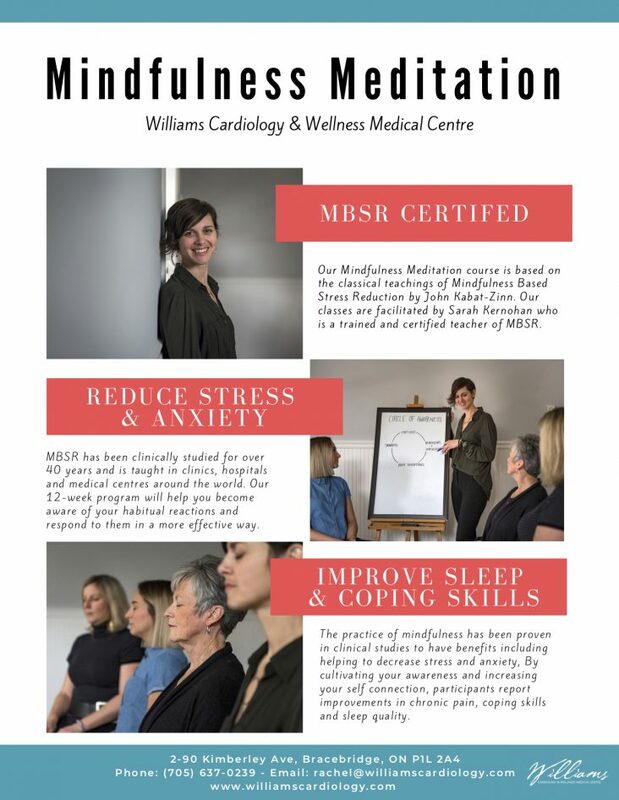 OPTIONAL: Supper Club and Yoga & Mindfulness Meditation classes are available for participants. All levels welcomed! Lots of dates and times to choose from but registration is required! For details and schedule, please call (705) 637-0239 or contact us here.